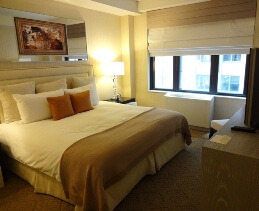 When it comes to hotels in New York City, a different set of rating criteria is needed. Quality matters, indeed, in Manhattan, but what really drives ratings is how much a hotel captures the city’s spirit. For millions around the world, New York is still a city of dreams, and the more hotels can put guests in touch with it, the greater the affection won. On the corner of Lexington and 50, The Benjamin has much in its favor. 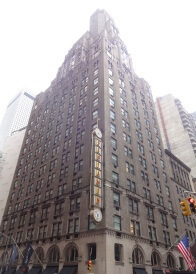 The building itself dates back to the Roaring 20s and was erected by one of New York’s busiest architects, Emery Roth. The art deco is worn subtly on the 26-story tower and most charmingly in the retro, thermometer-like sign attached to the tan brick. In fact, the building was impressive enough to artist Georgia O’Keeffe, who painted a night view in New York—Night. If your itinerary involves lots of Broadway, Times Square, and Rockefeller Center, The Benjamin’s location at Lexington Avenue and 50th Street is perfect—just far enough from the craziness but close enough for heels. It’s also on the major taxi route and near several subways, so transportation is never a worry. Step through the revolving door and the lobby restyles the Deco design into a more modern shade, with two thick central pillars and three massive mirrors along the east wall, which reflect the light and increase the sense of space. The appearance is the work of designer Lauren Rottet, who led the recently completed 3-year, $10 million renovation that extended to all parts of the hotel. My keycard slipped easily into room 1501, a one-bedroom suite (starting at $500 per night) on the Lexington Side of the building. As Rottet intended, the color scheme of the living area, bathroom, kitchenette, and master bedroom favored whites, silvers, mink and golds. At about 500 square feet, it’s decent size for New York, and strategically placed mirrors again maximize the illusion. As for the living area itself, it’s best suited for casual encounters, but probably not nuzzling. Luckily, the bed is just in the other room. One of the hotel’s main highlights, the custom-built “Benjamin Bed,” by Serta, finds that sweet spot between hard and soft. No doubt some of the equilibrium has to do with the 500-thread count Egyptian cotton sheets, down duvet, Anichini bedding draped over it. 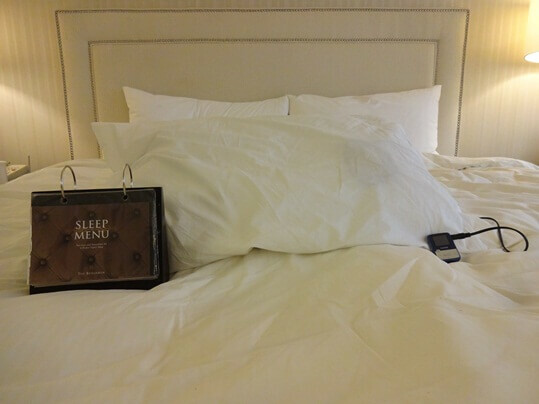 The hotel goes one step further to ensure quality sleep with its “Sleep Program,” which offers guests a selection of 12 pillows, including maternity, snore-no-more, and magnetic therapy. Not sure which to choose? Just ask the Benjamin’s sleep concierge, Anya Orlanska, for a recommendation. For me, the choice was clear— the “lullaby” pillow, equipped with ultra-thin speakers and an mp3 player jack. What better way to fall asleep than have Shine on you Crazy Diamond emanating from your pillow? No doubt the evening’s degustation at The National Bar helped ease me into dreamland. 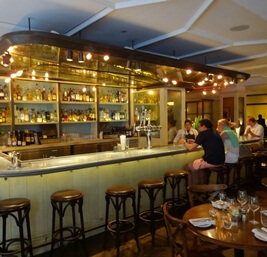 Located on ground floor of the hotel, the restaurant aims for a 1930’s New York bistro atmosphere and largely achieves it. For starters, the streets of Manhattan form the backdrop through large plate glass windows, while inside, the banquettes and booths are properly leather, lighting amber, and floor checker-tiled. Sunday nights, live Jazz joins the mix, with local bands often composed of Julliard students. What’s keep customers in their seats, however, is the American Bistro menu by Iron Chef-winner Geoffrey Zakarian. Whatever you choose as a main dish, begin with an order of the delicious Shishito peppers cooked in black garlic aioli and togarashi spice ($11). I followed this up with the just-as-impressive braised lamb shank ($32), with meat so tender it nearly dissolved on my tongue. Restaurant manager Dalio Calado has also brought his renowned mixology skills to the bar, most prominently in the smoked pineapple cocktail ($14), spiked with Fidencio Mezcal and Triple Sec. For a great dessert combo, match the mint chocolate-chip and mocha profiteroles ($11) with the house Port wine by Smith Woodhouse ($11 Glass $88 Bottle). The bed did not let go of me easily the following morning, but eventually the hum of the city creeps through the walls, onto the carpets, and inside the bedding. The small bathroom may not encourage lingering either, but it matters little when it comes to New York hotels. It’s not just the city that never sleeps, but the city that showers quickly and gets to work. The Benjamin Hotel fits in seamlessly to the rhythm of Midtown Manhattan and gives guests just enough of it to write home about.